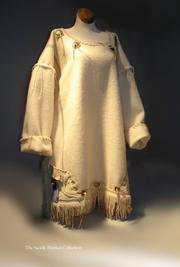 Coats and sweaters made from pristine 100% wool vintage blankets. Each garment is embellished with hand cut leather fringe, metal aged coins, leather toggle or German silver metal buttons, and perhaps Tibetan Lamb. They are one size and made to wrap generously around the body. The coats in the collection are $1,050. 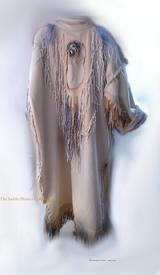 the ponchos are $975.